Did you know the story of the Bible is all about family? It’s true. Six thousand years of God’s big, dysfunctional family who He loves and continues to work with even though they continue to mess up. At KBM, we believe that understanding family from the Bible is the foundation for understanding God and living a fruitful life. Our ministry is dedicated to seeing your family healed, no matter what kind of issues you are dealing with. Then we show you how to apply principals from the Bible to deal with those issues. We want to help you communicate on a deeper level in your marriage. We will assist you in training and coaching your kids to become disciples of Christ. We teach you how to make it all work by connecting with the power of The Holy Spirit. Ken and Trudi Blount speak from years of hands-on experience and extensive research. Their creative, humorous, and thought-provoking style of ministry will leave your church charged to move forward into God’s best. Marriage is an institution that should not be taken lightly, yet, it is a proven fact that Christian marriages are struggling. Recent surveys tell us that Christian couples have the same likelihood of divorce (35%) as other people. A godly family is a powerful organization. Just as if you were the director of any corporation, the job you do as the CEO of your family will have an impact (for good or for bad) on your family’s future for years to come. Because of their disregard in following God’s principles for raising the family, millions of parents have literally handed their families over to the evil influences of this ungodly world. It’s time for families to turn back to the things of God, and turning back has to start with parents. At the Parent Company Events, Ken and Trudi Blount leave no stone unturned when it comes to raising a godly family. Lets face it. Trying to be a godly man in today’s culture is like trying to swim upstream in a river of raging rapids. The world seems to be working overtime to bombard us with images of what its opinion of a man is, from the hero style of Indiana Jones, to the couch potato of Homer Simpson, to the “queer eye” male image of today. The lines of what is right and wrong are getting blurred, and families in the home and in the church are suffering because of it. The Pure Man Event is all about bringing the picture of a godly man back into focus. 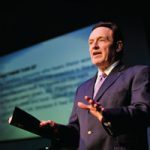 At these events Ken and his son, Josh, take a long, hard look at the differences between the world’s view of what it means to be a man and the Bible’s view. They also give practical insight on how to avoid the traps of the world for fathers, husbands, and single men. Being a parent to a teenager can often feel like an overwhelming job. The teenage world today is a dark, ugly place. Violence and drug abuse are at record highs, Gross sexual perversion is just a mouse click away, teenage pregnancies and abortions are common place, and major marketing companies are spending millions of dollars and stooping to all-time lows in order to grab the attention of unsuspecting kids. The simple truth is this: Your teenagers need your help! Even though they may not think they do, your teens desperately need your godly influence, counsel, and instruction in their lives. In each Parenting Teenagers Event, Ken and Trudi Blount equip parents with the tools they need, so they can navigate through the challenging parental waters of the world, offering savvy and practical tips on a wide range of relevant teenage issues. For many families, one of the biggest sources of disagreement and aggravation is the subject of family finances. For many, the money coming in never seems to match the money going out. Then, of course, the stress of what to spend the money on, and when, how much, and where always follows. Getting control of your finances means a lot more than just getting control of your money. It means getting a handle on your habits, your thinking, and your short-term and long-term goals. God wants to help you with your family’s finances. He wants His people to be financially fit so they don’t look like financial wimps. But the key to receiving God’s help is: You have to do things HIS WAY! 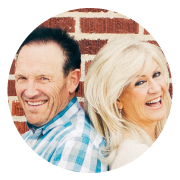 At the Financially Fit Family Event, Ken and Trudi Blount walk you through the ins and outs of God’s financial plan for the Christian family. We help you build the families in your church. Our ministry is dedicated to seeing families healed no matter what issues they are facing. Contact us and schedule Ken & Trudi today!